While it may not seem like Christmas weather here in Vegas, a few nights ago I went with my parents to check out the holiday lights at the Ethel M Chocolate Factory Botanical Cactus Gardens. These gardens are just up the road in Henderson, Nevada, and have been around almost my entire life, which is a rarity for anything in Vegas (we used to take field trips there when I was in elementary school). A little bit of Vegas history: Ethel M is the upscale chocolate line of the Mars Corporation (of MnM, Mars Bar and Snickers fame) , and is named for the long-deceased Mars’ family matriarch, Ethel. Back in the day, many U.S. states did not permit alcohol-filled chocolate to be made in factories, and so the Ethel M factory was built in the most lawless state in the union – allowing for their delicious liquer-filled chocolates to be made legally. And delicious liquer-filled chocolates they still are. One can still go on a free, self-guided tour of the chocolate factory, afterwards receiving great-tasting samples of their infamous peanut brittle and chocolates. Be warned: these chocolates are sold at a pretty price, but since my parents had a coupon, we paid less than the standard $18 for 12 fancy chocolates. 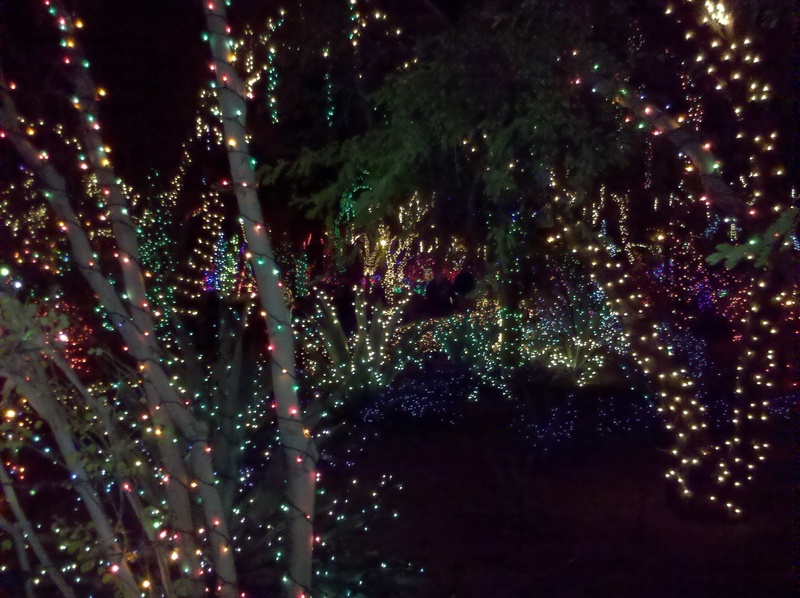 But now back to the best part of the Christmas lights in the botanical garden — admission is free. For us poor folk, this is a way better deal than the $9.75 general admission for the Magical Forest at Opportunity Village (although that is for a good cause!) and the $15 per car at the Las Vegas Motor Speedway’s Gift of Lights (which appears to be for-profit!). However, the Mars family is billionnaires and they did seem to be making a bundle on their chocolate sales…so I guess they can afford the free lights show. For those interested in going to Ethel M’s Holiday Cactus Garden, the spectacular runs nightly (except Christmas day) from sundown to 10 pm through January 1st. Neon lights, cacti and booze-filled chocolates…what could be more Vegas than that? This entry was posted in Las Vegas and tagged botanical gardens, chocolates, Christmas, desert, Ethel M, Las Vegas, tourism, Vegas history. Bookmark the permalink.